These are kid pictures, OK? And family pictures. Just so you know. 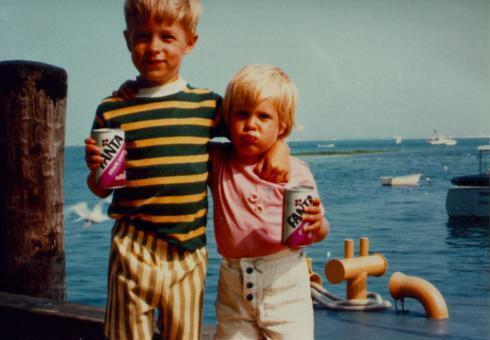 This first one is of my sister and I during one of our yearly family vacations to Cape Cod (Massachusetts). We’re on a dock where the fishing boats dropped off their catch every day. Fanta grape soda, I haven’t had that in years. 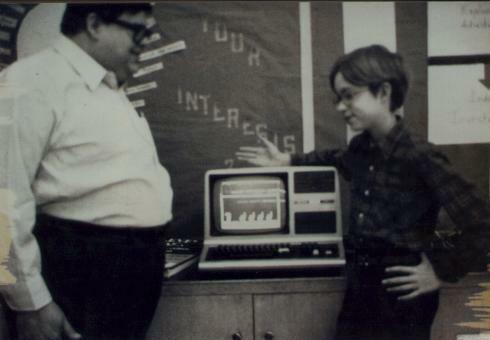 This is me with my computer teacher in, what, 7th grade? He was a great guy; I learned a lot from him. On the screen is a little animation I did for the cassette-tape magazine CLOAD, where five little dogs came out and dug up the letters CLOAD one by one, then the dogs left and the letters rose into the air. Got paid $10 for it, I think. I used to have some pictures of my parents here, but then I realized I hadn’t actually asked them for their permission, and they don’t necessarily feel that comfortable with everything in the rest of my pages. So I’ve removed their pictures, not because I don’t love them (which I do) nor because I don’t think they’re good pictures (which I do), but because their privacy is important to me.